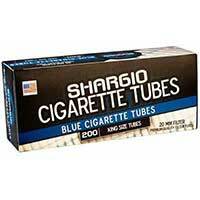 Available in Red, Blue and Menthol (King size only) Shargio Cigarette Tubes are some of the best in the industry! These less-expensive tubes are just as good as more expensive options and will enhance your smoking experience. 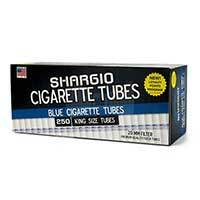 If you want a high, quality, flexible, reasonably price and American0made tube, then Shargio is what you need. 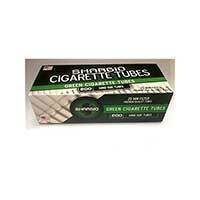 These tubes provide an excellent value and unparalleled quality that consumers expect from their cigarette tubes. You won’t need to worry about these tubes bending, breaking or tearing (especially when you get them out of the carton). Shargio Cigarette Tubes are made to the absolute highest standard so you’ll never have to waste your money throwing out ones that are broken.